Penguins are flightless birds that belong of the class called Aves. Birds are generally characterized by having an outer covering of feathers and being warm blooded. Their are about 17 different species of penguins, which are located exclusively in the Southern Hemisphere. However, contrary to popular beliefs, penguins are not just found in cold climates. Penguins range in shape and size. The largest penguin, is the emperor penguin standing 3.7 ft. and weighing 60-90 lbs. The smallest is the fairy penguin; it stands at 16 in and weighs only 2.2 lbs. Penguins are black and white but sometimes have yellowish- orange markings on them. Penguins mouths are lined with spiny, rear-directed spines to help when swallowing live prey. Penguins seem to have a lot more feathers than other birds, with about 70 feathers per square inch. Penguins are uniquely designed for the water. The darker and lighter colors are a way of protection for the penguins, when in the water looking up at the underside it is a lighter color and matches the sky and light above it, and when looking down on it you see darkness like the bottom of the ocean. They have large heads, short necks, and elongated bodies, which helps them with swimming. A penguins feet are webbed and are set far back on its body, to help it to stand up right when on land. Penguins reproduce sexually, and reach sexual maturity from 3 to 8 years. The normal breeding time for penguins is spring through summer. Courtship varies among the species, It begins with both visual and vocal displays, Many males display first to establish a nest site and then to attract a a female. Most penguins only have one partner during the season but sometimes a female penguin will have up to 3. The female penguins compete for the males and they are the one who choose their mates. Penguins lay eggs, their eggs may be white to blue or green. The nest that holds the eggs is called a clutch and normally only contains 2 eggs. The male is the one who protects the eggs, he will keep it on his feet for the months before it hatches. Penguins are considered some of the most social of birds. Communication involves a variety of physical or "displays". Penguins eat krill, squids, and fish. Some of the smaller penguins eat only krill (a tiny shrimp-like animal). Some penguins will chase after Rock Crabs also. The different species of Penguins live in a variety of areas throughout the Southern Hemisphere including the Antarctic continent. They have managed to successfully adapt and colonize one of the lowest temperature climates on earth, reaching as low as -140 degrees Fahrenheit. Emperor Penguin lives all around the Antarctic continent. King Penguins live on islands far to the north of the Antarctic. Some of the islands include, Crozet, Prince Edward , Kerguelen, South Georgia and Macquarie Islands. Rockhopper Penguin live on most of the islands in the Antarctic region. Gentoo Penguins live on many of the islands of the Antarctic region but the main colony is on the Falklands. Magellanic Penguin live on the shores of the Falklands, Argentina, and Chile. Galapagos Penguin are found on the Galapagos Islands and on Isabela Island. Adelie Penguin live on the Antarctica continent. African Penguin live on the coast of South Africa and on the offshore islands. Little Penguin live on the coast of Southern Australia, Tasmania. Royal Penguin are found on Macquarie Island located far to the south of Australia. Yellow-eyed Penguin live in New Zealand and the sub-Antarctic Islands to the south of New Zealand. Snares Island Penguin are located on Snares Island. Chinstrap Penguin are found on the islands of the sub-Antarctic Region and the Antarctic Peninsula. 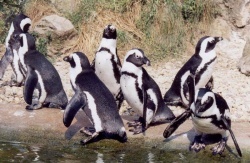 Humboldt Penguin are found in Peru and Chile. Macaroni Penguin are on the sub-Antarctic Islands of South Georgia, Crozet, Kerguelen, Heard & McDonald Islands.Also located on the small islands of South America and Africa. Fiordland Penguin are found in New Zealand. Erected-crest Penguin are found on Antipodes Island, Bounty Island with smaller colonies found on Oakland Island and Campbell Island. This page was last modified on 25 February 2015, at 21:30.